Group and promote vegetables and herbs as complements to specific ethnic dishes. Our country and communities are ever-evolving and expanding melting pots of people from all over the world. The unique foods we eat and the plants we grow are part of our cultures and a link to our homelands and heritage. At the same time, more and more people are exploring and enjoying different cuisines from around the world in restaurants and in their own kitchens. These trends present an opportunity for independent garden centers to put the spotlight on ethnic vegetables and herbs, and in the process, increase sales and bring in new customers. There are many ways to bring ethnic vegetables to the forefront. Colorful displays with informative signage, plants and seeds, recipes and even samples of mature varieties (from local markets or produce stands) are sure to get attention. You could even have local chefs prepare simple recipes, such as green salsa or Chinese chicken salad, using the vegetables and herbs you are selling. Let your creativity take over. 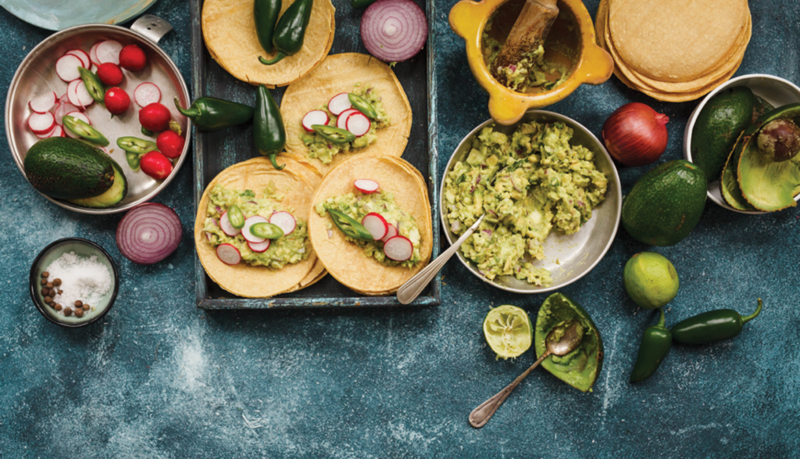 For example, promote a Mexican Food Festival highlighting some of the vegetables listed on page 44. Decorate with colorful sombreros, serapes and piñatas. Serve nachos with homemade salsa. You’ll bring in families as well as new customers. And at the same time, sell plants and seeds and all the other vegetable growing necessities — potting soil, organic matter, fertilizers, irrigation equipment, seed starting kits, pest solutions and more. Here are three ethnic groupings with vegetables and herbs that fit naturally into cuisine. You could find similar choices with almost any fare. Some of the suggestions are obvious, and you probably already carry the necessary seeds or plants. All you may need to do to focus on a specific cuisine is to group plants accordingly or choose varieties more closely tied to that group. Other varieties are more obscure and may be as difficult to source as transplants, but should be available from specialty seed companies. This is a huge, diverse group of plants that includes mustards, Chinese cabbage and leafy vegetables with exotic names like Komatsuna, mizuna and tatsoi. Explore seed catalogs that specialize in Asian vegetables to appreciate the full breadth of these interesting vegetables. The mustards are especially eye-catching. Even if customers don’t like the spicy flavor, many, such as Osaka Purple and Japanese Giant red mustard, have extremely colorful leaves and are worth growing as ornamentals. Adzuki beans, broad beans, winged beans, yardlong beans, hyacinth beans and soy beans (for edamame) are just some of the beans that are used in this flavorful category. Large, tap-rooted, white radishes eaten fresh or cooked. Often spicy hot when grown to maturity. Most familiar are the excellent-flavored, long, thin, purple Japanese eggplants, but there are other shapes and varieties with green fruit. All eggplants are very ornamental and look great in pots. Asian melons often have exotic flavors that make unique additions to fruit salads and stir-frys. It’s a large, diverse group, which includes bitter melons and even luffas. Best to start with sweeter varieties. A wide variety of peppers, both hot and sweet, are used in Asian cooking. Shishito is a small, usually mild green pepper, which is very popular as an appetizer. The peppers are quickly blistered in a well-oiled frying pan and served hot. They can also be used in tempura. The fiery hot Thai chilies are born on compact plants with very colorful red or purple fruit. They are beautiful when planted in containers. So many opportunities here, it’s hard to list them all. Stalwarts like Thai basil, cilantro, green onions, garlic, mint and chives are all at home in Asian cooking. Dig a little deeper, and you’ll find more exotic plants like aromatic lemon grass, minty Shiso and even tender kaffir lime and ginger. Make edibles relevant for customers by promoting them in groups organized by ethnic cuisine. 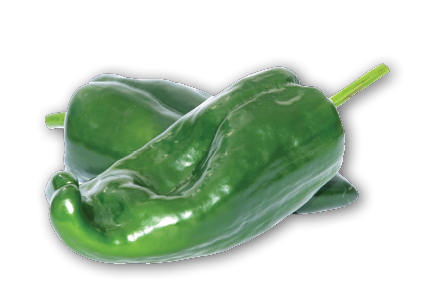 An obvious choice, but besides the tried-and-true like jalapeno, ancho, pasilla, Poblano and Serrano, also feature the super-hots like habanero or Chile de arbol, and flavorful heirlooms such as serrano tampiqueno. Provide recipes for salsa, guacamole and chiles rellenos, and tips on how to dry or grill peppers. Another easy choice, but also look to the large-fruited heritage tomato, Mexico, and any of the sauce tomatoes. And, of course, nothing makes better salsa than easy-to-grow tomatillos. Heirloom shell beans are a natural for Mexican recipes. Many are tough plants with excellent drought resistance. Look for specialty varieties like Montezuma Red (also known as Mexican Red), but pinto beans, Jicama and other familiar varieties also fit here. Although novelties, many of the ancient Indian corns like Black Mexican (also known as Black Aztec) could be included here. For that matter, any sweet corn sprinkled with chili powder, fresh lime juice and bathed in butter fit the bill, as long as you provide the reminder on how to do it. A member of the squash family, it grows on a vigorous vine that will sprawl over almost anything and is often grown on a trellis. The summer squash–like fruit is eaten fresh or cooked. The leaves and tuberous roots are also edible. Another sprawling vine best grown on a trellis. The sweet, crunchy root is eaten fresh or cooked. Performs best where the growing season is long and warm. Many summer squash varieties are used in Mexican cooking, as are the squash blossoms. Cilantro, garlic and Mexican oregano are must-haves for south-of-the-border recipes. But there are others, like uniquely flavorful Epazote (also known as Mexican tea) and Mexican Tarragon, a marigold relative that makes a good substitute for regular Tarragon, especially in hot climates. Flat Italian beans, purple-podded Trionfo Violetto, cannellini kidney beans and the delicious Signora della Campagna red and green pole bean are just a few of many to choose from. Try sprouting broccoli and rapini or the otherworldly Romanesco. Mostly purple and bell-shaped, there are many including Nadia, Traviata and Galine. Nubia and Angela are purple and white striped. White eggplants include Clara and Aretussa. A tremendous amount of variety here from lettuce like Lollo Rossa to arugula, chard, spinach, radicchio, chicory, endive and kale. Bella Tuscana and Arancino are two delicious Italian cataloupes. There are many others. What would Italian cooking be without peppers? There are pepperoncinis, Italian sweet peppers and a huge variety of bells to fill this special role. San Marzano and Roma are well known Italian paste tomatoes. After that there are many to choose from, including Italian giant beefsteak and the ribbed Corleone types. So many — basil, chives, fennel, garlic, marjoram parsley, oregano, sage and thyme. What herb isn’t used in Italian cooking? Many even come in Italian varieties.